Any lingering hopes that the PSNI might one day move into the long-planned training centre at Desertcreat are dead in the water, a Mid Ulster MLA and former Policing Board member has said. The original plans for the site were for a joint NI Fire and Rescue, PSNI and NI Prison Service site at Desertcreat. However, a fresh planning application relates only to a multi-million pound NIFRS ’Community Safety College’ – described as including “a fire station, teaching accommodation, multi-purpose training warehouse, hot-house, swift water and skid-pan facilities”. 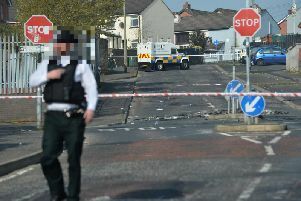 While the PSNI did not take the opportunity to officially rule out a future move to the site when asked by the News Letter, the former Policing Board member and Mid Ulster DUP MLA Keith Buchanan said it was highly unlikely the PSNI would ever move on to the site. Mr Buchanan did, however, welcome news of the fire service’s planning application. “The Desertcreat site plans, initially, were very ambitious and would have been great for the area,” he said. “It’s been talked about now for many years and obviously where we’re at politically and financially, I don’t see it happening from a police point of view. “It is good to see the fire service there, for the whole economy in Mid Ulster, but it is only part of the jigsaw. “It would have been good to have seen all the agencies there as originally planned. I just don’t see that happening now. “It would have been a world-class facility.